As part of our St. Louis Lucky 33 series, we are excited to share with you the formal living room reveal. Here’s how we turned this room into an accessible space perfect for intimate conversations without being stuffy. Scout & Nimble designer Jesse Bodine tells us how she took on this challenge. Out of all the rooms in the house, this was probably one of the most intimidating spaces for our clients. They don’t consider themselves overly formal people, but wanted to make sure they were utilizing every square inch of their home to fit their lifestyle. While they understood the value of a “formal living room” as a space where they could entertain their friends without being distracted by the TV, they also wanted it to fit their more casual life. This included being a space that even the kids could enjoy hanging out in. The living room space is one of the first things people see and we loved the idea of drawing guests in while learning about the family who lives here in the process. 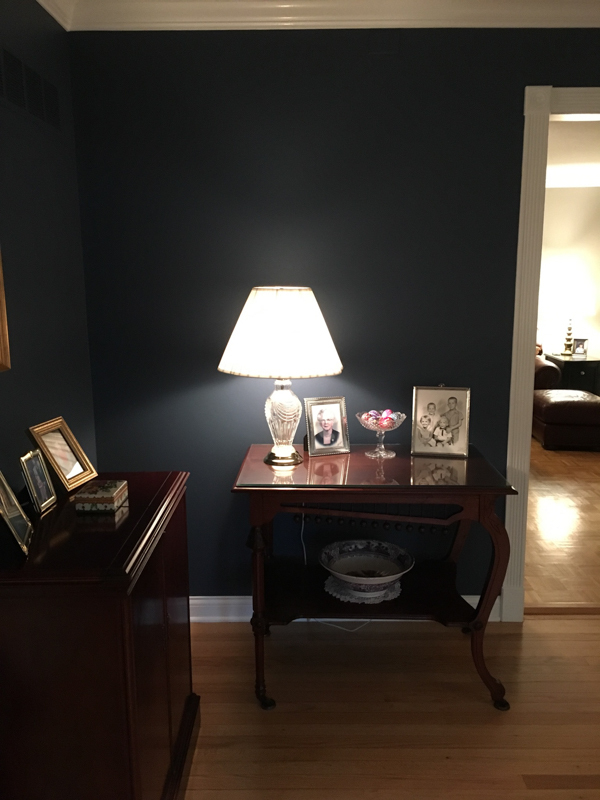 We replaced the navy walls with Benjamin Moore’s London Fog. Don’t get us wrong, we love a dark color on the wall, but we needed this space to feel brighter and the new gray color accomplished that. We started with one of our favorite rugs of all time, the Anastasia Slate. The colors in this rug are beautiful and its distressed/over-dyed look make it a top choice in homes with kids or pets. This is because it is incredibly resilient and hides dirt and stains exceptionally well. We chose to go with two Chesterfield club sofas with a nailhead trim to serve as the main seating. We balanced the chesterfields with two leather channeled chairs because we didn’t want a room that felt too traditional. Their mid century clean lines and soft camel-colored leather add so much interest and elevate the feel of the room. We went with the Ryan coffee table to serve as an anchor to all of the pieces. Its curved lines allow everything to revolve around it during a get together. This is also one of our favorite pieces to use in a kid friendly area. Its soft edges make it the perfect place for kids to gather while sitting on the floor to play games or do a puzzle. The backdrop to the room is the bookcases, creating the perfect space to display accessories and personal mementos. We kept them in white to keep the focus on all of the special pieces that our clients have collected over the years. By keeping in mind this family’s personality, we were able to make a formal living room perfect for both company and their fun family of 4. You can now shop all the Formal Living Room Products here! Love the Lucky 33 Remodel? Check out other Lucky 33 rooms below!